Deacon (Gordon Kennedy) is a priest, skeptic, and professional debunker who has been hired to investigate the strange occurrences at a small English church. His team includes a cameraman, Gray (Robin Hill) and another priest, Father Amidon (Aidan McArdle). The weird happenings at the church defy explanation, and soon enough things start escalate. A suicide spurs Deacon into trying to take direct action against whatever is happening by bringing in an exorcist. They come to discover that the church grounds where built over and older pagan site of worship. 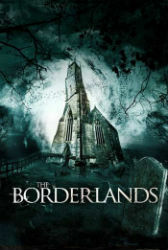 Things only get worse when the team is separated and Deacon discovers a huge labyrinth that exists underneath the church. He enters it in a desperate hope to find his lost colleges. The Borderlands is another low-budget found footage horror film, but with the key difference that it’s actually very good. Taking a few notes from Paranormal Activity (2009), The Borderlands creates a reason for there to be constant filming of the events. The story isn’t going to win any awards for creativity, but the film is excellent at building up moments of tension and paying them off. Most notable is that The Borderlands ends on a fantastic final moment that is frightening and unexpected. The acting is good all around, everyone feels naturalistic, and Deacon is an enjoyable lead character. You find yourself warming up to all these people, and that makes what’s coming for them all the more brutal and horrible. The Borderlands is a great example that found footage horror can still have merit.